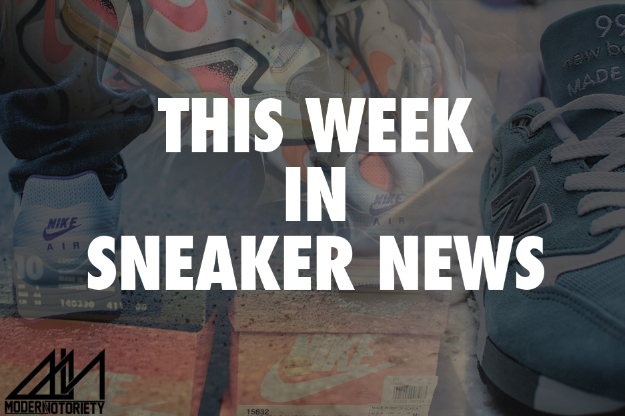 Last week was a crazy week for sneakers. In case you missed it, here’s a roundup of the biggest news to go down. Jordan Brand refuses to stop with the heat. Check out the AJ XIV in red suede, Wolf Grey 3s, Royal Blue AJKO, Black Metallic 3Lab5s, Champagne VI Retros, and a second collaboration with Nike SB. Curious how the sneaker scene is like on Guam? Find out here with our recap of the Sole Pacific x Scion sneaker meet. Foamposite fans, rejoice. The “Yeezy” foam is set to release on April 29. Click here for more details. If Foams aren’t your thing, check out these Air Footscapes in the popular pink and green colorway. Meet Cameron Hicks, a student doing big things for our newest Week in the Feet interview. adidas has been making waves with the bold ZX Flux colorways, but this simple “Weave” version is too clean to pass up on. Don’t sleep on the new olive green Superstar 80s as well. Both shoe are perfect for the warm weather coming up. Black and grey is one of our favorite color combinations, and Vans does it nicely with the latest “Aloha Skull” Authentic. Nike has three amazing packs lined up for this season. Check them out–Blazer Mid VNTG Ostrich Pack, Air Max 1 FB Mercurial Pack, and the Air Max 1 Summer Suede Pack. Jordan 2’s are making a big comeback this season with three new colorways. Which are you copping? If you weren’t already convinced that the “What The KD” VI was a dope shoe, these photos will change your mind. Reebok and the Keith Haring team are back with another collaboration, this time an orange and black take on the Classic Leather Lux. Wondering how a Jordan-inspired running shoe would look like? Here’s your answer. JB enters the running shoe world with the Jordan Flight Runner, which features all the latest Nike tech. Fellas, you’ll be mad that this adidas x Topshop collection wasn’t made for the guys. My personal favorite piece? The Superstars with the graphic-print stripes.